Investor-owned utilities (“IOUs”): Corporations with shareholders who benefit from any profits. The rates that IOUs are allowed to charge are approved by the state’s Public Utilities Commission (PUC). Municipal utilities (”Munis”): Nonprofit public entities. Muni rates are regulated by city councils or locally appointed utility commissions. Rochester is the state’s largest municipal utility, but munis mainly serve smaller communities throughout Minnesota. Cooperative utilities (“Co-ops” or “rural electric associations”): Member-owned nonprofit organizations that serve rural areas. A co-op’s rates are governed by a board of directors elected by its members. While cooperative utilities can opt to have the PUC regulate their rates, only one–Dakota Electric Association, south-east of the Twin Cities–has chosen that option. Co-op service territories cover 85 percent of Minnesota, but account for only 18 percent of retail electric sales. In Minnesota, where you live determines which electric utility serves you. An electric utility is required to serve every customer in its territory. Unlike electricity, natural gas service does not touch every corner of the state. It is too costly to serve areas that are far from the pipelines that deliver gas to Minnesota. In other places, rocky terrain, forests, wetlands, and other geographic features make it too difficult to provide service. In addition to regulated utilities, some small companies provide natural gas service. Companies with fewer than 250 customers in a municipality and fewer than 5,000 customers in total aren’t required to be regulated. Customers who do not have natural gas service most likely heat with delivered LP gas (propane), fuel oil, wood, and/or electricity. 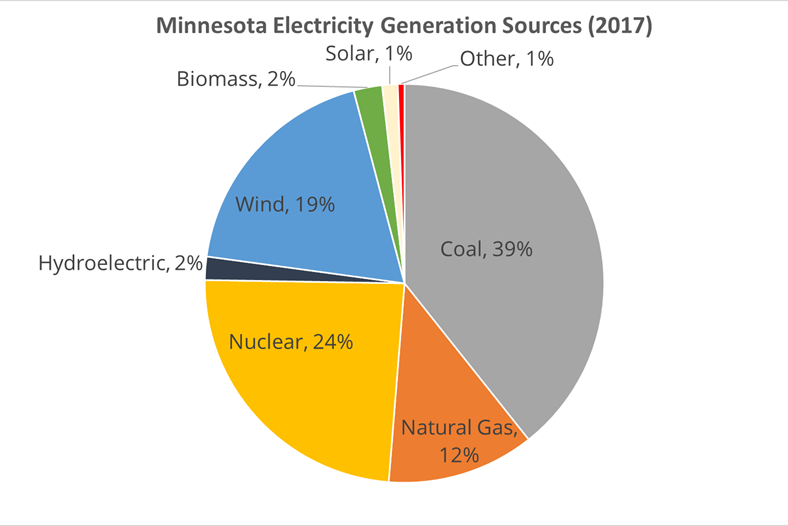 The electricity that lights your home or business will come from various sources, but the chart to the right shows Minnesota’s total in-state power generation mix. Over the past decade coal power generation has declined, but the state still has more than the national average. Minnesota also taps more wind power than the national average, and it is continuing to grow. Solar power also is rapidly growing. While solar is still less than 1% of total power generation, that is expected to change within the next few years. Utilities own some generation sources, like power plants and wind turbines, and so do independent companies that sell power to the utilities. The power that is not generated in Minnesota is delivered from other states or Canada on high-voltage transmission lines. Customers also own sources of generation This ranges from industrial customers with big power generators to homes with rooftop solar panels. Even if customers own generation, they’re almost always still connected to the utility grid. Want to get renewable power? Learn more about how to power your home with wind or solar.